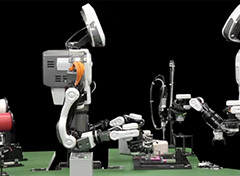 ●NEXTAGE has bilateral vision similar to humans, which allows it to ascertain object distance. With the global eye in the head, there is no need to reeducate the robot when it is out of alignment with the work flow. 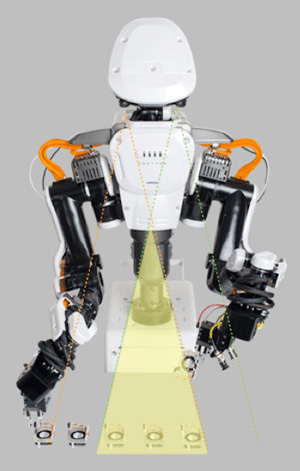 The robot can attain 3D coordinates with high precision by placing “cross marks” that allow it to maneuver well in midst of varying brightness in the surroundings. 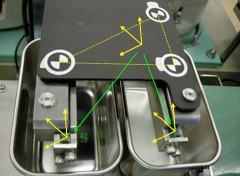 The robot is able to correct minor deviations in its positions by associating the tasks with certain cross marks. 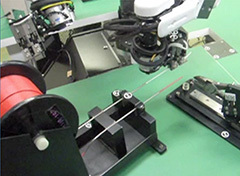 A stereo camera attached to the head detects changes in the work environment and allows the robot to respond to shifts in the production line or handle simple installations.